Last week during #journchat, I saw a reference to a post titled Does Your Twitter Handle Belong on Your Resume? The author is a PR college student, and the conversation around the post is mainly tactical, but the bigger picture surrounding our online identities is one I’ve been wanting to address for some time, so this gives me the opportunity. I’ll briefly cover some basic points about the nature of online space, but then I want to dig into the opportunities that are available in a networked culture. #1. The Web is made up of mediated publics. Persistence – What you say sticks around. This is great for asynchronous communication, but it also means that what you said at 15 is still accessible when you are 30 and have purportedly outgrown those childish days. Searchability – My mother would’ve loved the ability to scream “Find!” into the ether and determine where I was hanging out with my friends. She couldn’t, and I’m thankful. Today’s teens’ parents have found their hangouts with the flick of a few keystrokes. Replicability – Digital bits are copyable; this means that you can copy a conversation from one place and paste it into another place. It also means that it’s difficult to determine if the content was doctored. Invisible audiences – While it is common to face strangers in public life, our eyes provide a good sense of who can overhear our expressions. In mediated publics, not only are lurkers invisible, but persistence, searchability, and replicability introduce audiences that were never present at the time when the expression was created. A quick review of these characteristics serve as a good reminder that what you do/say/post online is effectively being done in public. When framed in this context, the results of much of the research being done around managing online information seem expected. 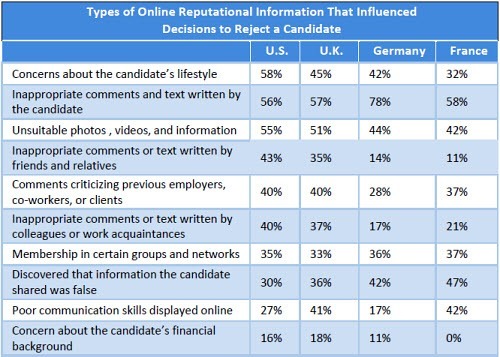 For instance, take a look at this chart, taken from ‘Recruiters really care about your online reputation even if you don’t.’ The top five reasons mentioned here to reject a candidate for recruitment are things that would be equally inappropriate if done directly in front of that potential employer. The article goes on to highlight a growing trend by companies to make online screening a formal part of the hiring process. So the answer to the question of whether to put your Twitter handle on your resume may end up being moot – they’re going to be checking it out either way. #2. The publics are becoming more public. In December, Facebook made some changes in how users’ privacy works, but what about other transparency tools whose public acknowledgement (or criticism) hasn’t been quite as widespread? So … I search Google … and in response, Google searches me. You can watch a video explaining the social circle features here, or click here to see directly who’s connected to your connections. Both of these examples would suggest a shift in the level of transparency with which we are comfortable. Some will still be apprehensive about this shift, and so for them, it can be a comfort that these services are opt-in: if you don’t want other users seeing your information, you can either increase your privacy levels or delete your account. But now as everything moves towards the “social,” it’s not even about your information any more, but it’s about your information in relation to everyone else’s. So a more accurate statement than ‘the publics are becoming more public’, is that the publics are becoming more contextual. From the perspective of a job-seeker hoping to keep certain content hidden from a potential employer or recruiter, this is something to seriously think about. As I scrolled through Google’s Social Circle and looked through the Secondary Connections, I was surprised to see who popped up as connections of my connections. You’ve heard of the six degrees of separation as a concept – but now with tools and visualizations that map our networks it has become apparent. And as the tools get better, it will become easier for anyone to find out about anything that’s been put online about or by you. By tapping the network, everyone on the planet has access to you within just a few steps. #3. What’s your social capital? 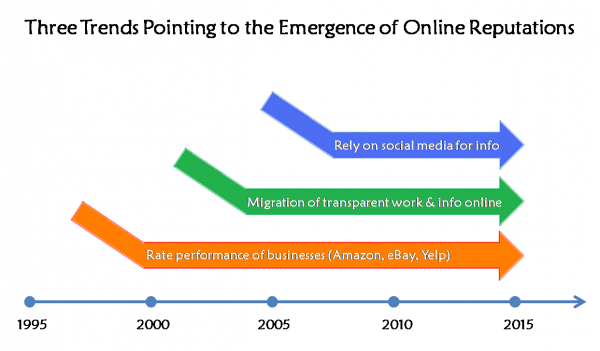 I was reading a post the other day by Hutch Carpenter, In the Future We’ll All Have Reputation Scores , where he looks at three trends he sees as leading us towards meaningful online reputation scores: He references pieces by a few others, like Ross Dawson and Google’s Amit Singhal, who are also writing about the increasing visibility of reputation. The crux is that this stuff is already out there, we’re just still treating it as a game. If you’ve looked at TweetLevel or Klout or even the Whuffie Bank, you’ve seen the various attempts being made to understand and measure people’s influence, popularity, engagement, and inherent value within a network. It makes me wonder how long it will be before we decide that displaying your Twitter handle on your resume is irrelevant – it’ll be more important to display the value of your Whuffie. #4. How do I become a network weaver? I touched on this idea last year, in the post The Future of Collaboration Begins with Visualizing Human Capital, and then again recently with my video contribution on Nokia’s IdeasProject site, but it’s seeming more and more clear that we need to figure out how to leverage this information – both for businesses to facilitate innovation, and for society to facilitate positive social change. We’re nodes in a network. We all have strengths and skills, but they go to waste if we don’t know how to connect them with and through the right people. There’s a movement taking place that’s pushing us towards a model that’s more relational and contextual, or as John Hagel puts it – the Big Shift – “from knowledge stocks to knowledge flows” (break down silos dividing talent and information), “from transactions to relationships” (build trust to encourage value exchange), and “from institutions driven by scalable efficiency to institutions driven by scalable peer learning” (increased competition and economic pressures will demand a collaborative workforce for success). I think a personal accountability needs to be taken in order to make this happen. It’s not going to get orchestrated by someone at the top, nor should that be the expectation. If our organizations or social networks function as complex adaptive systems, self-organizing bodies comprised of independently functioning agents, then we would imagine this to be a process that will develop organically. And I think it will – we just need a push. 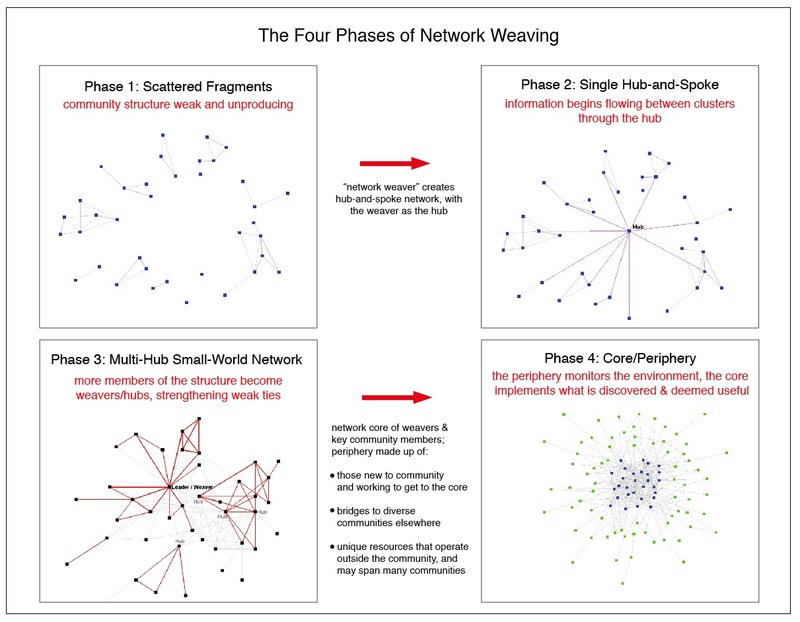 I came across a paper written by Valdis Krebs and June Holly, called Building Smart Communities through Network Weaving, which provides a very interesting overview of how to develop a successful, innovative business ecosystem. It suggests creating a network map of the organization in order to visually track ties, and then design strategies to enable new connections. Instead of allowing networks to evolve without direction, successful individuals, groups and organizations have found that it pays to actively manage your network. Using the latest research we can now knit networks to create productive individuals and smart communities. This reminded me very much of what’s happening as my Twitter network is growing. I’ve started to map out my network using mindmeister to understand who’s who and how I can connect people within my network to each other. I had hoped to have it complete by the time this post was written, but I’m currently following over 900 people, so it’s going to take a while. What has been great is that even though I have less than 50 people mapped out so far, I’ve already pulled up the mindmap several times when I’ve wanted to direct a link to specific people who I thought would find it valuable. I’ve also started using the hashtag #networkweaving when I “introduce” new connections I make to connections I already have who share common interests. I’m finding it a lot more valuable to others than doing a general #followfriday. I guess I’m just figuring out how to be in Phase 2, but in a very tedious way by cobbling the visualization together in mindmeister. For me, 900 is already an unmanageable number to be a good “network weaver” without the proper tools. Until there’s a Twitter application that will map my entire network for me in a meaningful way, I feel limited in my ability to grow the network any larger. The best I can do right now is to try and facilitate more meaningful connections within the current network. But this has certainly been a shift for me in how I operate on Twitter altogether. So the conclusion here (or conversation starter, I should say) is that our online reputation management shouldn’t be limited to what we don’t want people to see or say about us. Let the understanding that you’re in public guide your judgment about what to post online. Instead, what if we think about our online reputations as the bridges that serve to enhance the network itself? @JDEbberly – RT’d @Mikinzie Does Your Twitter Handle Belong on Your Resume?